We supply directly to trade in cask, keg, cans and bottles in Manchester and surrounding areas, and nationally via wholesalers and brewery cask swaps. It’s vital that our beer is enjoyed in the best possible condition, wherever it is poured, therefore we work hard to build strong relationships with our new, regular and longstanding permanent customers. Scroll down to see how we can work together to sell more great beer! Been a customer of Brightside for years. They’ve an excellent range of delicious craft beers and are possibly the most friendly and helpful bunch of brewers we’ve ever met. Did I mention the beer is delicious? I was first introduced to Brightside Brewing Company at the 2016 Manchester Beer & Cider Festival. I liked the fact that they are a family brewer and also their branding and we became a customer of theirs soon after the festival. The Brightside range has grown hugely in the time since and the addition of the Wildside sister company was a masterstroke. Both Brightside and Wildside always pass the three key tests of taste, aroma and clarity and it is a pleasure to consider them as one of our key suppliers. We have been getting our lovely Brightside beers in now for two and a half years. I always find the range of beers really good with something for all. The branding, as well as the quality of the products, is also great as our customers notice and comment on the beers quite a lot. Nothing is ever too much for Carley and the team, deliveries are always prompt and dropped off with a smile JWe wish them every success moving forward, and will continue to stock Brightside products here at the club. Bar Manager, GMP Sports & Social Club Ltd. The range of beers available is exceptional. The regular cask ales are superb and offer a wonderfully diverse choice of styles and abvs. There’s always something new brewing too with the latest, Seven Waves, being an excellent example. The swaps with other breweries always add an extra option and we’ve had some cracking beers that we wouldn’t have been able to get easily otherwise. From a cellar management perspective, the beers always handle and serve perfectly making life that bit easier behind the scenes! Brightside’s delivery and customer service are superb and they are flexible, accommodating and prepared to do as much as they can to get an order delivered. We at the city arms love Brightside Brewery in every way. Odin is one of our biggest sellers by a country mile and we never seem to have enough of it! Carley and all of the gang are the loveliest cats and, we couldn’t wish to deal with a nicer bunch. All in all, without doubt the greatest beer, service and brewery in general we have had the delight of working with and we love dealing with every week. Brewing for taste instead of trends, Brightside can’t be beaten for consistency & quality, they’re one of Manchester’s best kept secrets. Our customers’ eyes light up when they see Brightside beers on our bar because they know they are getting a top quality, flavoursome pint. Their large stable of varied beers is now supplemented by a more experimental Wildside brand so there’s plenty of choice. It’s always a pleasure doing business with their friendly and efficient sales & delivery team. We’ve been using Brightside Brewery for just a few months and we’ve never looked back. The team are all ace….and the beer is pretty special too! They can’t do enough for us and have on more than one occasion, saved our bacon! Professional, friendly, efficient & we’ve heard nothing but positive comments about the beers we serve! Top of their game and without doubt providing Manchester & beyond with a service and products to rival the the biggest brewers! Cannot recommend them enough (sometimes they bring a dog with them too – bonus!). I’ve been working with brightside brewing co. for just under 12 months now and we are going from strength to strength. The great range of regular beers they have on offer alongside their plethora of guest ales makes them a great addition to our cask range. The standout pump clips gives each beer its own unique identity but allows the customer to know who has brewed each great pint without asking. The addition of their Wildside range and keg range allows us to offer a wide variety of beers from a great brewery with all offering unique selling points. Brightside came to our aid in 2015 when we aspired to have our very own ‘Academy ale’ brewed in conjunction with our 25th anniversary. We loved their range of ales and wanted to work with someone working independently, much like ourselves! 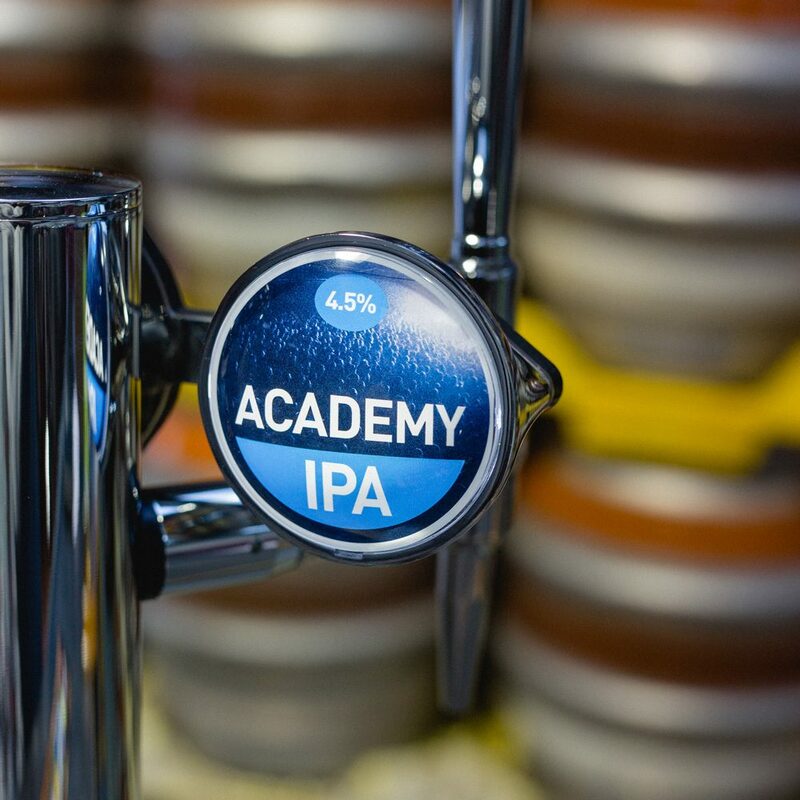 The Academy IPA has been enjoyed in our venues and Student Union bar in cask, keg and bottle since then and it’s great to have our name on a beer, a real beer, one that not just looks the part but tastes the part! WE LOVE BRIGHTSIDE! We deliver direct to our customers across Greater Manchester, Lancashire, Cheshire and Merseyside. We can also supply through our partner wholesalers or via pallet for larger orders. Local deliveries are free of charge, orders placed with wholesalers, and pallet deliveries may be subject to charges. We can supply many national pub companies such as Greene King and Enterprise through SIBA. Get in touch to find out which beers we can supply and how we can work together. We fit single and multiple lines for customers that love our beer and want to shout about it! We’ll also look after anything that might go wrong with that kit to keep the beer flowing and customers happy. We produce bespoke house badges for our core range beers. Given the right volumes, we can even design a brand new beer especially for you. Everyone wants to drink the perfect pint. 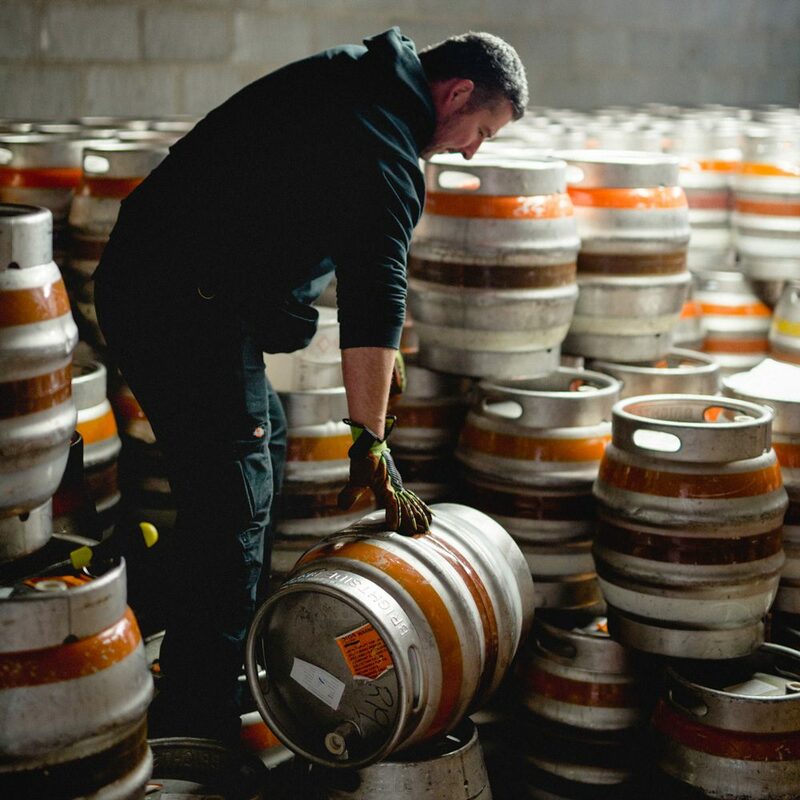 If your staff need a little help to get there we can train them on all aspects of cask service, and can advise on the best beer dispense system for your cellar. Without information, our’s could be just another beer on the bar. Let us share what makes our beer great with you! Come to the brewery and see for yourselves on a staff tour or brew day, or make a date for us to visit you and share our stories and beers. Eye-catching POS materials to promote our beer. We provide quality pump clips and keg badges to advertise our beers, plus branded glassware, beer mats, bar runners and for our established customers, bespoke items on request. We work with microbrewers from around the country to bring new and exciting beers to Manchester that wouldn’t otherwise leave the borders of their brewers’ counties. Shout up to find out what we have available this week.